Right to Left Mr. Marwan Al-Zein Lebanese Ambassador in Riyadh, Ghassan Kabbara prospower G.M. 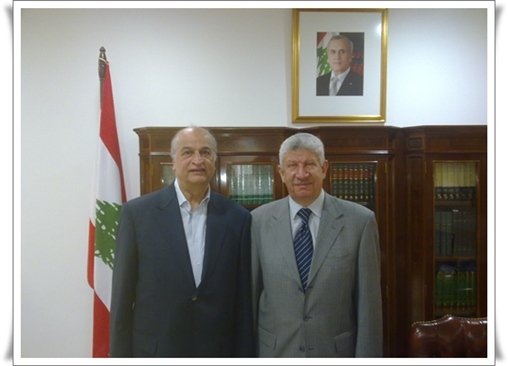 In his tour in Saudi Arabia, Ghassan Kabbara, the General Manager of Prospower paid a courtesy visit to His Excellency General Marwan Al Zein, the Ambassador of the Republic of Lebanon in his office in Riyadh, Saudi Arabia on the 15th of May, 2011. In the meeting, Mr. Kabbara informed His Excellency about the organizing of its first international trade fair TITF 2011 which will be held at Rachid Karami International Fairgrounds, Tripoli Lebanon from 21 to 25 September 2011. The Ambassador showed a lot of interest in this kind of trade events and its positive impact on the city of Tripoli and Lebanon and encouraged Mr. Kabbara to meet Saudi trade associations and companies for a good participation and explained how Saudi Officials and businessmen are keen on having the best relations in all aspects with Lebanon. Mr. Kabbara affirmed to His Excellency that all efforts are being made to have a good participation from the kingdom of Saudi Arabia as well as participations from other countries of the Middle East, Asia, Europe and Latin America. His Excellency wished to see a successful event and promised to visit the fair if he happens to be in Lebanon during the event in September 2011.